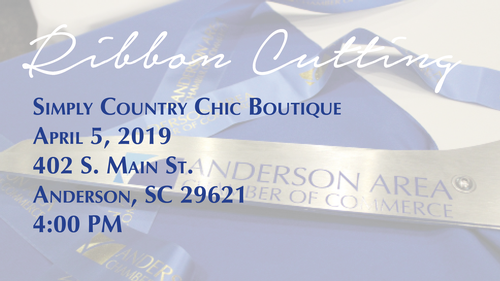 Please join us for a Ribbon Cutting for Simply Country Chic Boutique on Friday, April 5, 2019 at 4:00 PM! Simply Country Chic Boutique is located at 402 South Main Street, Anderson, SC 29621. Our founder and CEO Dawn Drucker has owned and operated Southern Soap Shop since 2013 and it has always been her goal and dream to have a store one day. Downtown Anderson, SC as always been the spot she had in mind and even the building we are currently in has been the one she has had you eye on, so in late 2018 when the building became available again she decided to make her dream come true, of course with the help of her family. They knew not only can she make great soap but she has a passion for other things like fashion, farmhouse decor, and just all things rustic and southern.